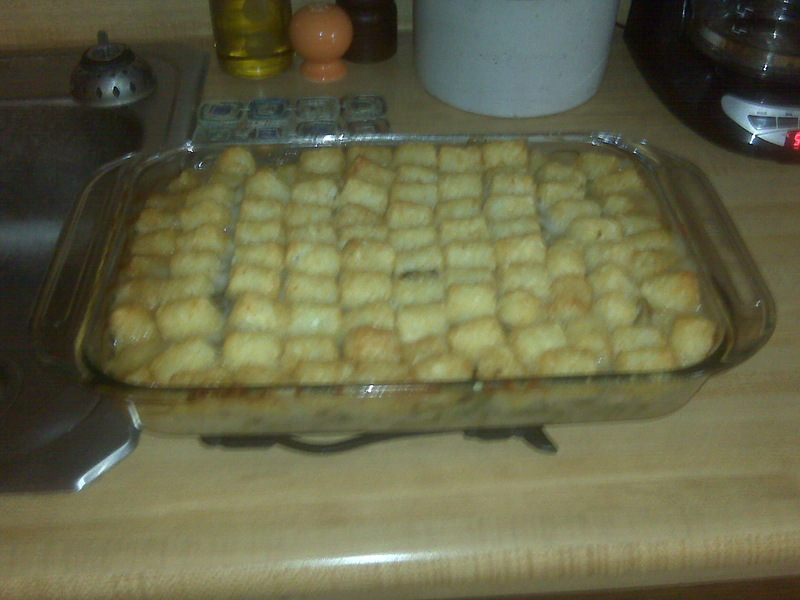 When I decided to make tator tot casserole I knew I had all of the ingredients because it is a very simple recipe. I just ran to the grocery store to get some ground beef. The rest of the recipe calls for cream of mushroom soup, frozen green beans, onions, and frozen tator tots! I leave out the onions because they never seem to cook up enough to take the really oniony taste out. All you do is layer all of the ingredients: ground beef, soup, beans, tator tots, and bake for an hour and it comes out hot and bubbly! There’s nothing like your favorite childhood recipe on a cold, windy, fall day! And I had leftovers to live off of for a week! >As a college student who really enjoys to eat…I always make time for a meal. But at last week’s Badger Homecoming game the excitement of keeping the axe kept me from eating lunch at the stadium and the heat overwhelmed my oatmeal and banana breakfast. So, right after I jumped around, I felt quite a bit light headed and had to get some water and hot dog. Now, nothing tastes better than when your hunger is overwhelming to the point of fainting (it was probably a combination of heat, hunger, and lack of sleep too!). That lukewarm hot dog, soggy bun, ketchup and spicy mustard tasted better than anything I had had in quite a while. So when I got home I decided I wanted hot dogs for dinner. After walking to the grocery store to buy hot dogs, spicy brown mustard, and hot dog buns I sat about making my meal. I understand why some people choose to not eat hot dogs but they are pretty darn delicious with the right toppings. My first hot dog was too hot and the bun was too sturdy. I let my second hot dog sit in the bun for about 15 minutes before I ate it and it was too cold. Halfway through my third failed hot dog I was not only full, but frustrated at the fact that I couldn’t recreate the magnificent hot dog. Conclusion: 1) There is no way to make something taste as good as it did when you were so hungry you couldn’t stand in the student section of Camp Randall for the rest of 4th quarter unless you had something to eat. 2) There is no way to make hot dogs taste as good at home as they do at a stadium (any type of stadium usually has good hot dogs!). Moral of the story: Spend the $4 at Camp Randall to get the stadium hot dog experience and don’t wait till it is absolutely needed just to make it t0 5th Quarter! >One of the most fun things about eating at a restaurant is trying to figure out how to make some of the dishes. For the past year or two I have been going to the Ethiopian restaurant on State Street, Baraka. They serve stews with potatoes, lentils, chicken, carrots, and beef. I usually get the combination platter that has a stew with chicken, carrots, and a savory red sauce and a stew with lentils, potatoes, and a spicy brown sauce. I am not a very big fan of the Ethiopian sour bread so I usually get my stews over rice. But the showcase reason I keep returning to Baraka (even their lunch cart on Library Mall!) is the cold lentil salad that comes with entrees on the lunch menu. Dinner entrees come with a generic dinner salad so whenever I go I always ask to substitute the salad for the lentils! I have been trying to figure out what is in the lentil salad for quite a while and recently got some help from one of the servers who gave up some of the secrets. It is made with brown lentils that are not cooked to mush (which is like a lot), chopped onions, chopped green peppers, and is marinated in olive oil and apple cider vinegar. The only thing missing are the spices. I have decided it is probably salt, pepper, lemon juice, garlic (a lot of it! ), and cumin. I just purchased all of the ingredients and am looking forward to figuring out if my recipe tastes like the original Buraka salad! If you’ve had the Buraka lentil salad and have suggestions for my recipe let me know!